the strong smoke didn’t enhance the spicy cheese. I speculated – maybe a milder smoke would be better. Still, I went to bed planning a blog post filled with culinary dismay. breakfast, gave the cheese, now thoroughly cold and solid, another try. Fabulous. 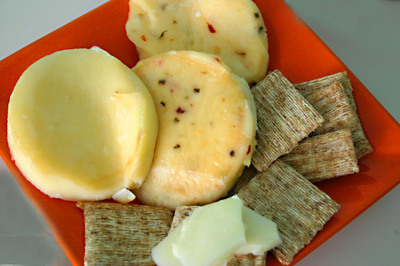 Pepper jack? Delish. fantastic. Add the barbecue sauce and my mouth was awake and singing. didn’t keep great notes while I cooked, but here’s roughly what went into what. cold (which also firms them a bit), the next day. smaller blocks and put it into ramekins. Made nice little rounds of smoked cheese. Chill it before you remove from whatever container you smoke it in. Great with triscuits. of it through the blender and made a smoother, though still textured dip. Like the shrimp, it’s better the next day. a bit and the vegetables and fruit give up their juice. Well, I’ve heard people say that everything tastes better after a smoking binge. Oh wait, that’s something else. 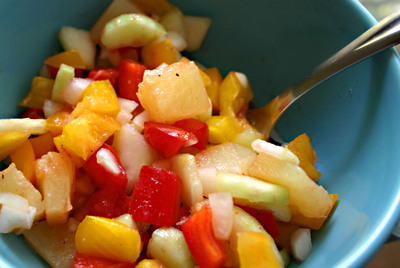 I wish I were joining you for those shrimp, your sauce, your cheese, and that lovely veggie fruit salad. Eaten on vacation, by the ocean, with your loved ones — nothing could be better. Have a great holiday weekend! One thing about marinating seafood in lemon juice is that it starts to “cook” immediately. I know smoking is a low and slow process, and I’ve never tried smoking shrimp, so I can’t advise on the wood or the timing, but maybe a different type of marinade (something sweet?) would counteract the smoky flavor. Interesting that they mellowed the next day, too. 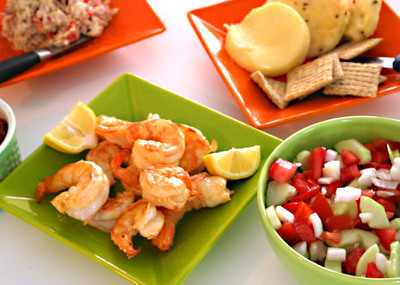 OH boy, that smoked shrimp looks so good and I adore smoked cheese – it’s so great in toasted sandwiches! You are putting the smoker to great use! Well you are welcome to join us anytime, Kevin. You and Ed have a great holiday weekend too. I’ll try a sweeter marinade next time, Lydia, though I liked that it started to cook a bit with the lemon since that meant we could smoke it for a shorter time. I guess I just need to play around with all the variables — type of wood, marinade, smoking time, etc. and see what tastes good. A project for another vacation! Hadn’t thought about making toasted sandwiches with the smoked cheese, Freya. We usually just eat it on crackers — silly us! I’ll get on this one right away. Recently when I had marinated chicken in fresh lemon juice, olive oil, garlic, and fresh herbs, my husband grilled it with wood chips on the Weber and they gave the chicken such a strong smoky flavor that I thought the marinade had been a complete wasted effort; all I could taste was the flavor of the smoke, so I know what you mean here. Shrimp has a delicate flavor that may not lend itself to smoking the way some of the oilier fish does, with its stronger flavors. Don’t give up on the shrimp!! I did my own (first) batch, along with scallops, tonight and they were delicious! I didn’t really know how much wood to use, used maybe a tablespoon, think I had the stove too hot, they cooked zip-zip. My chef friend only cooks shrimp/scallops to an internal temp of 120 — that was a little low for me on the shrimp so tonight I did them to 130. For me, they were perfect. Everything looks great, Christine. I have no experience with smoking but have had smoked fish before and it was soooo good. I’m glad things tasted better though it was the next day. I can only imagine your dismay the on the first day. Rebecca, you might be right — the smoke flavor certainly overrode the marinade. I have had smoked shrimp before that didn’t seem as strong as this, though. Alanna, I wonder if the difference is in the type of smoker. Are you using a stove top smoker or a stand-alone grill type? I know, Cynthia — smoked fish is sooooo good! Been looking at the smoked trout over on Alanna’s site and it’s making me drool. I’m so pleased to hear you like fruits and veggies in the same salad. I’m always surprised (and a little saddened) by people who say they hate fruit in their salad. Yours sounds so cool and refreshing and must complement the smoky shrimp nicely. 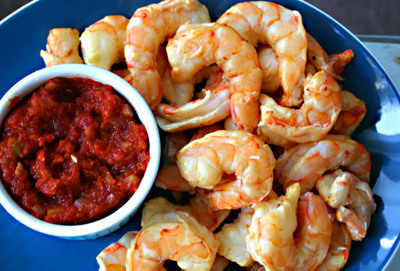 An enviable and endless bounty of Gulf shrimp. Perhaps a shorter smoking session next time. They sure look good from here.